As you might have expected, there was more digging today. There was also a bunch of other stuff, including a short staff meeting before pottery reading, and work I had to catch up with on the computer, so there isn't going to be as much blogging today as on other days. However, tomorrow I have a day off. Most of the volunteers will be taking a trip to Jerusalem, but as I live there, I figured I'd pass on the tour. This is a slightly different angle than usual. The reason that I'm only showing the southern half of the square is because that's where the vast majority of today's digging happened. And, hopefully, it'll be a little simpler to see what we've done in this picture, than it would be in a somewhat wider angle shot. As usual, if you want to see the lines I've drawn, clicking through the next image is probably the best way to go, though I suppose it's possible that it's all visible on monitors with better resolution than mine. While there's still a certain amount of flattening as a result of the bright, direct sunlight, I think that the difference between where we're digging and the ground two meters lower is sufficiently clear that it doesn't need outlining. On the other hand, the Byzantine wall looks flatter than it is, so I've outlined that in red, and labeled it one. Hopefully, you can now see that we've come across another course of stones -- while some of that wall was robbed out, not all of it was. 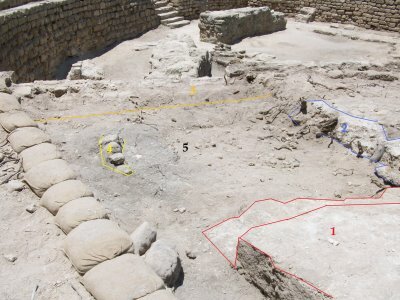 The bit that I've labeled two, and circled in blue is a line of white plastered stones. There are two courses in some of that, though I don't think you can see it, and we haven't found the bottom of it yet. If there's more of it further down, it goes from a little strange to a lot strange, as the bit in the next square over doesn't go very deep at all. The orange line shows approximately where the trench for Garstang's wall begins; it's harder to see in this bit than in the bit further north, but it's something that you can feel in the consistency of the soil. Along with the trench, there's also a bit of the wall visible in the bit I've labeled three. There was more before I hit it with a pickaxe for much of the day, and took the rocks away. Which demonstrated how aggressively out of shape I am. I imagine that five more weeks of digging will do something about that. The bit circled in yellow and labeled four is a little row of little stones. I have no idea what its deal is. It's in the middle of a rough-edged bit of ashy fill, and doesn't seem to go much further down. Maybe more digging will show what that is, and maybe it won't; finding out what those are is going to be one of the goals for Sunday. And then there's five, which is basically all the rest of what we've dug today. Pottery reading is showing a lot of Crusader period sherds, so it might be fill from the robber trench, and it might have been someone in the Crusader period who dug that trench, and took the Byzantine walls stones to build something. I'm hoping to find out exactly what's going on here, and maybe define different areas on Sunday, and then spend the rest of next week digging the more northerly half of the square.